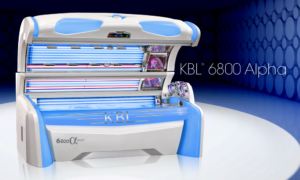 The KBL 6800 Alpha Pearl proves tanning technology just got a little brighter. Powerful features combine with a gorgeously artistic exterior for a unit that sets high expectations at first glance, and then exceeds them all. As anyone who’s ever interviewed for a job or been on a blind date knows, first impressions matter. And the KBL 6800 will never disappoint, with distinctive lines, a footprint that exudes power, and eye-catching colorMotion exterior lights that allow you to customize an unparalleled color design. As soon as a client lays eyes on it, their perception of your business will be heightened. Even with the exceptional aesthetics of the 6800, KBL units always follow the motto of form over function. You can rest assured that the machine’s performance will surpass the lofty expectations set by its appearance. Total lamp wattage of 10,980 will transcend the tanning needs of even your most demanding clients. Four 500w facial lamps, facial reflectors and two 250w shoulder lamps provide the type of results that can’t be overlooked. In the modern era of tanning, performance extends well beyond tanning prowess; comfort and style are more important than ever to client experiences. The 6800’s AAA comfort, including aquaCool, aroma and air conditioning, sends tanners into euphoria each session. Bluetooth connectivity and a MP3, SD card audio system with volume control allows them to bring their own vibes to their session, while megaVoice technology instructs users for an easy experience. For business owners, efficiency and reliability are equally as important as tanning power and features. That’s why the 6800 offers a 200w Electronic Ballast with CPI that eases maintenance requirements and ensures equal output throughout the life of the lamp. Service bay LED lighting also allows for optimal ease of maintenance when necessary. Integrating the KBL 6800 Alpha Pearl in your tanning business will raise your expectations of tanning equipment and your client’s expectations of the tanning experiences they desire. For more information, call PC Tan at 800-FASTTAN (327-8826).